"Made of alloy 510 phosphor bronze, these coils provide good corrosion resistance in most environments. 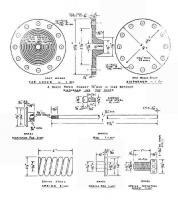 They're used for making almost every style of flat and coiled spring, including tubular springs..."
I haven't checked my blueprints, but I think that this is the material I specified for diaphragms in my Steam Automatic blueprints. Available in a wide range of thicknesses, and sounds unlikely to have work-hardening/cracking issues. Point and click ordering from McMaster; on your shop bench in a few days. I seem to recall seeing references to "phosphor bronze" alloys in 1900-1930 engineering books/articles, so this might be the same alloy that the oldtime steam cars used for pressure-sensor/control diaphragms. 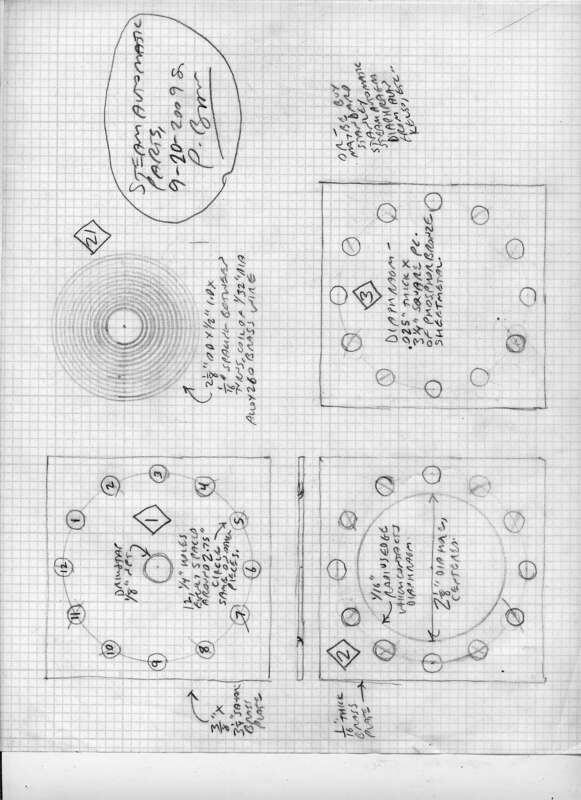 Many old light-steam hobbyist blueprints specify "brass" for parts which I later learned were actually originally made of bronze alloys. Ah, my Steam Automatic blueprints folder just turned up. Dated 7-30-2009. Prints might have been posted on this forum around that time. Diaphragm 0.025" thick 510 phosphor bronze. Annotated "or buy standard Stanley Steam automatic diaphragm from Alan Kelso, etc". Bolt hole pattern, 12 bolts, 1/4" diameter, on 2.75" circle. Spring: mcmaster #1841k14, or MSC p/n 07663750. Code green xtra hvy duty chrome-vanadium die spring. Dang it, the valve body isn't up to my current standards. Needs redesign. Rats. Forget about the diaphragm. Just make a small feed pump style ram / cylinder with a good packing and have the end of the cylinder connected to your boiler and have the ram actuate your fuel valve...with a spring calibrated for your cut off pressure attached to the ram. I use braided flexible graphite for the packing...it can handle boiler temps and nothing leaks past it. I have made a few of these and they work great. For a Stanley automatic I'd definitely use a beryllium copper diaphragm as the metal is very tolerant of extreme distortion, far more so than brass which is an absolute no-no for such use. I had a steam automatic from JR Goold which had a B/C diaphragm and in my early inexperienced days set it up with far more travel than was needed. It lasted several years but eventually the distorted diaphragm did fail and I was amazed at how much of a bulge it had tolerated. Why re-invent what is accepted and proven practice? For a Stanley automatic I'd definitely use a beryllium copper diaphragm as the metal is very tolerant of extreme distortion, far more so than brass which is an absolute no-no for such use. just a side note beryllium copper, is poisonous, use care when grinding or machining. Edited 1 time(s). Last edit at 12/25/2018 07:43AM by Jeremy Holmes. Yeah, some 25 years ago I welded the stuff regularly, until I found out about the dangers. Spent another 10 years periodically worrying about delayed toxicity. Thanks for the info, While were on the subject, another one to watch out for is chromium. Brazing Cromoly tubing for long periods, I've gotten hit twice. The only symptoms I incurred are high fever and shakes. It's not pleasant and lasts 6 -8 hours. A respirator and proper ventilation is necessary. Another "Toxic Alert" I have received from several experienced builders is _zinc_, from galvanized steel. Heat that beyond a certain point, via welding, brazing, or even soldering of zinc-plated components/materials, and it emits toxic zinc vapors which, if inhaled, even in small quantities, can send you straight to the Emergency Room at your local hospital with serious poisoning. Sanding/cutting of epoxy composites, without proper protection, also has negative health effects. Mike, I have to do some experiments to find out what to make the diaphragm out of, because despite many searches I have not found a place where I can buy beryllium copper in small quantities [very frustrating! -- pardon my "venting"], and it is toxic to work with even if I did find a source. But mainly, if I can't find it, then I can't use it. Beryllium copper seems to be one of the alloys in the unobtainium series. Phosphor bronze sounds like a promising alternative, and may be exactly what the old-time steam car manufacturers used. Even if it doesn't last as long as beryllium copper, it might still last an acceptably long time. But for all we know maybe beryllium copper is popular because it lasts 10x as long as old "hard brass" diaphragms, whereas phosphor bronze, which nobody tried[? ], might turn out in experiments to last twice as long as beryllium copper. I have some ideas for a motorized hydraulic test rig to see how many flex cycles the diaphragm will handle before breaking. It would not be complicated or difficult to build. Obviously if the test diaphragm breaks after a few flexes, it's no good. But if it lasts for many thousands of cycles, then it just might be suitable. Zim, A spring-loaded plunger would work as a pressure sensor, in fact plungers were used on some light steam equipment back in the early days, but the friction of the packing on a plunger varies with adjustment and wear, and a few other factors. Result: more frequent re-adjustment to keep the same fuel-shutoff boiler pressure. But it does work. With diaphragms, adjustment is less frequent. Edited 8 time(s). Last edit at 12/27/2018 09:31AM by Peter Brow. Edited 1 time(s). Last edit at 12/27/2018 03:01AM by Peter Brow. Oops, no, that's my version. Thanks for opening this thread. Jamison mentioned using a simple piston with high performance seals. I was wondering the reason for using a housing and diaphram verses a piston? I'm putting this into a ball park situation: with 1-1/2 to 2 inch diiameter piston (like the Stanley Automatic) you can achieve the same force. Hypothetical situation where you operate at 400 PSI. 3/4R gives you ~706 lbs force on the valve and 1R gives a ~1,250 lbs. Spring counter force looks to be 500 - 750 lbs, again, ball park. Not sure what the "K" is for that type of spring. Just seams like an overkill situation. It obviously worked well though. Any body...any insight to this design? The piston would work just fine. Although it involves moving parts. We use the term "Steam" for lines like this, but the reality is that is a dead ended line down low and instead of steam reacting on the piston or diaphragm, it's condensed steam - water; which one would hold up longer in a water only, no lubrication set up? As I mentioned earlier, the thing to keep in mind is there isn't much travel on the rod (area of burner orifice opening vs area between the seat and ball when displaced) even a copper or brittle brass would hold up quite a while flexing over a large span, only moving .05" perhaps. What would help too is anneal the copper or brass prior to installation by heating the diaphragm up dull red and allow to cool slowly. That might be a trick they used to make them last longer. Quote: "Another "Toxic Alert" I have received from several experienced builders is _zinc_, from galvanized steel." I've ran in to that one quite a bit, welding galvanize metal, it emits a white smoke that if breathed for a long period can cause nausea, the antidote is drink milk, I don't think it's ever bothered me, but as I'm typing this I'm reminded of a Red Green quote when he's talking about getting hit in the head a lot over the years "I don't think it's ammected me fentally", then he looks sorta confused and says "yeah, ammected"
A buddy of mine had a name for an athlete who's taken a few too many hits over the years. Dane. Dane Bramage. "Might lead to some other ideas..."
Is it possible to use Bourdon tube of some appropriate old manometer, and some levers instead of needle? Or the acting force would be too small and not enough to move that ball? Bourdon tubes were often used. I've seen them on the Baker steam tractor, the various Newcomb steam systems used them liberally and they were the component employed for the pressure relay in the Yuba steam tractor. Ive learned to watch out for "Perfect world engineering", that's engineering that resides in a perfect world and omits, time, resistance, corrosion, thermal expansion, heat transfer coefficients and host of other real world conditions. The diaphragm pressure sensing element is pretty rock solid reliable, evidenced by it's usage in just about every pressure regulating device for the past hundred years. No need to reinvent the wheel. Here are the rest of the shop drawings for my version of the Stanley Steam Automatic. 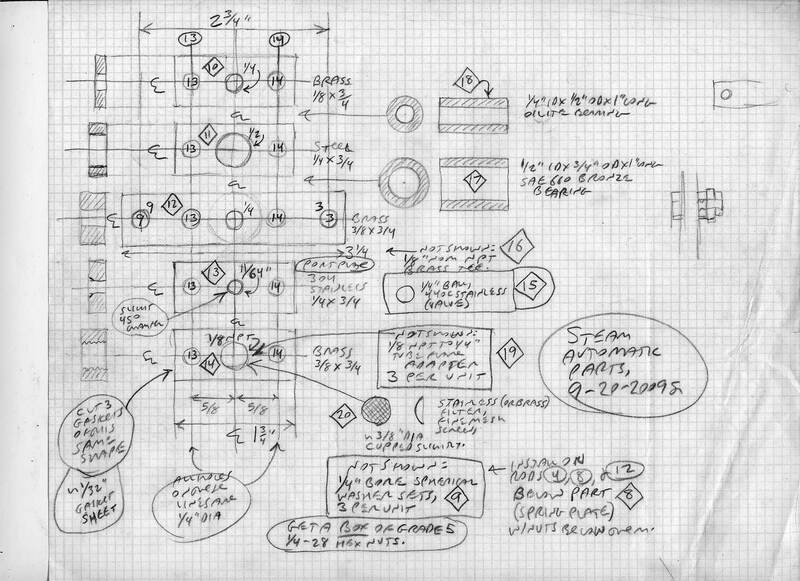 Note: not built or tested yet, experimental drawings, scheduled for modification/improvements, caveat emptor, your results may vary, kids don't try this at home, do not take this medicine if you are allergic to this medicine, etc.. That last one is my current favorite "caveat", often used in patent-medicine TV commercials. Kinda like a bottle bottom that says "Open Other End"
I agree with Ron about not re-inventing the wheel; these drawings are to suggest that a diaphragm-style Steam Automatic doesn't have to be difficult or impossible to fabricate by folks with limited budgets, tooling, fabrication skills, etc.. Lots of "bits" in this design, but easy machining. Many simpler, easier to fabricate, and/or otherwise better designs for essentially the same device are almost certainly possible. 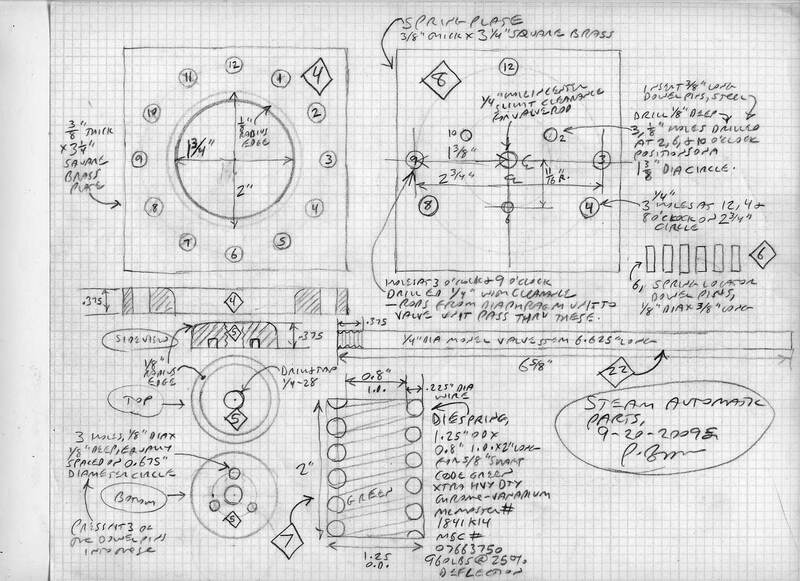 Note the influence of John Wetz, Graham Baker, and others in the "machined/bolted plate stack" design. They built lots of similar stuff that ran great. Of course, if custom patterns, castings, forgings, welding, advanced machining, etc are possible, then use 'em -- and duplicate the original time-tested Stanley Steam Automatic. My Steam Automatic design needs work, but I suspect [subject to building/road-testing verification, as always] that the 440C stainless valve ball, Monel valve stem, carbon-fiber/graphite [Garlock 98 or equivalent] packing, and stainless valve seat are improvements over the Stanley design. Lots of vastly-improved materials and components are easily available [point and click internet ordering, delivered to your door in a few days] to the humblest backyard steam experimenters today, which even the most illustrious, ingenious, & best-funded steam builders/manufacturers of yore could not get at any price. Edited 2 time(s). Last edit at 12/29/2018 02:21AM by Peter Brow. 6-foot lengths of 1/4-inch-diameter/28 thread per inch [tpi] Grade 8 threaded rod [usu 4140 steel, rolled thread w/no "stress risers" at thread roots] are McMaster p/n 90322a668, US$17.27. 150,000 psi minimum tensile strength, "stressproof" alloy. Load/unload, flex to and fro, no problem. 4140 is often used in dune buggy frames, which fly off of 40 foot tall sand dunes & hills and slam into the ground endlessly, with no breaks. It's kind of durable. I use a lot of it, various diameters & threads, in my engine & other steam car designs. Way tougher, yet costs little more than the relatively weak steels that White, Doble, Stanley, and others used "back in the day". Only person I know of who used this type of alloy in a steam plant is Mike Clark, whose 4340 H5 Stanley engine frame is a marvel of design and craftsmanship. I know you have since sold the car Mike, but I think that your engine frame will still be chuffing delightfully down the road at least 100-200 years from now. Sorry, but when I see good stuff I have to give it a "shout out" at least every few years. Pre-1910 steam car updated & vastly improved with early-21st Century materials/detail-design -- and not losing originality. Mind-blowing. Edited 1 time(s). Last edit at 12/29/2018 03:06AM by Peter Brow. Tip-of-the-hat to you! I totally get the reasoning for the diaphragm methodology in the burner automatic. I didn't think about the condensate of the steam and water, not steam, pushing against the diaphragm. The addition of oil makes sense also. Perhaps an arrangement where oil would float on top of condensed steam. Noteworthy to mention that all burner diaphragm controls are below in perspective to the boiler and relatively close to the nozzle. It all makes sense now. Your design posted has potential. Here is the contemplation, what spring force do you use for the control? Design needs to account for 0 to 400+ PSI. In later Stanley(s) the pressure can exceed 600 and up to 1,000. On the Stanley, the adjustment turning bolt provides for the range. That brings up another question to all, where can you find these heavier than normal springs? On another note, I like the hand drawing method. I think there is greater creativity. Just saying, my opinion. PS...For What It's Worth (FWIW), haven't heard that one before. Quote: "I like the hand drawing method." Peter, yeah that works and that's how many of us started out nailing down a concept, I still have some of my old drawings from umpteen years ago that I did with my old drafting table and drawing head. That was then and it worked when all we used were manual machines and a calculator. Nowadays with the advent of CNC equipment, CAD is definitely the way to go. We used to have to use a calculator to determine the angles and line lengths etc, it can all be done in the CAD now, drawing can be layered for interference fit etc. It saves time and eliminates a ton of mistakes. The lines on screen are what the CAM side of the software uses to create the machine language. CAD and CAM software can be had pretty cheaply now. CAD/CAM is great! About 10 years ago, I bought a drawing program but was too impatient to finish the designs I was working on, to put in the hours needed to get good with it. In 2005 I got to see first-hand the CADCAM setup at ModelWorks in England, very impressive. I think the drawing program was by SolidWorks. Change one thing, and the program would modify nearby details as needed, or point out possible interference, clearance, load concentration, and other problems. Then it would turn the drawings into spectacular sales-brochure-quality color 3-D renderings which could be rotated, sectioned, converted to "see-through/x-ray" views, etc.. Mind boggling. The software sent instructions directly to the CNC machining stations, of which ModelWorks had a fair number. Definitely the way of the future. One of these days! Not too many years ago Ford bought one of the Italian supercar manufacturers. Reportedly when Ford engineers toured their prize acquisition after the deal closed, they were surprised to find a lot of manual machine tools which were 100 years old or older, with old-school skilled machinists to run them. They weren't expecting to find that in a factory making some of the hottest hi-tech sports cars in the world. It's probably all CAD/CAM now. I have all the spring numbers in my 2009 notebook; no time to dig 'em up. Springs: look up "Die Springs" in the McMaster online catalog, mcmaster.com . Wide selection available, also non-die springs like extension springs, for lighter-load apps. Going from memory, I seem to recall that the spring in this Steam Automatic, if set for 500psi shutoff, would give full fuel valve opening at somewhere around 400psi boiler pressure. Go to mcmaster.com and type in the part number in the search box; that will get you right to the data for that spring. Easy math; for example if it has a spring rate of 5 lbs per inch, then the spring tension would increase by 2.5 lbs if compressed another half inch, and like that. Full opening for a typical poppet valve is considered to be about 1/4 travel (from closed) of the port diameter. EG, a poppet valve with 1" diameter port is full open at 1/4" travel from closed. Die springs like these, and many other components like O-rings, etc, come in "industry standard" sizes & types, so the identical item can be bought from different manufacturers and retail/wholesale suppliers, like MSC, Grainger, McMaster,-Carr, etc.. There are industry-standard part codes, and some catalogs have charts which give part numbers from different suppliers. The McMaster-Carr catalog gives spring rates, minimum and maximum tension and % compression [or extension], etc, all very useful in selecting a spring for a particular application. Being old-school myself for the time being, I like looking things up in the print/paper McMaster catalog, which McMaster only sends to their big institutional customers, like factories, hospitals, etc.. However, many of those companies don't use the paper catalog, and sell their copies. In 2015 I bought the latest print catalog from a big machine shop in Georgia via eBay, for like $70. 3952 pages and 3" thick; makes a great anchor for ocean liners in a pinch. Received in mint condition, it is already getting dog-eared from heavy use. Older editions, like their #105 catalog (1999) have useful charts and data which are no longer in the current [or previous-edition] print or on-line catalogs. Of course you can browse the complete latest-edition catalog on-line for free, and point/click order. One downside of my Steam Automatic design is that to adjust spring tension/shutoff pressure, you have to turn 3 separate nuts, pref. ~1/4 turn at a time, and ideally check with dial calipers to get the adjustment even. The spherical washers are there to keep nut corners from digging into the plate [part number 8] which they bear on, during adjustment. Also note the locknuts below plate 8. That is another thing I want to redesign, to make it adjustable by turning one big hex nut or bolt. As an aside, watch out for "nominal sizes" versus actual sizes. Like with steel pipe, a "1/8 inch nominal size" pipe is nowhere near 1/8" in any dimension. For Schedule 40, "1/8 inch pipe" is 0.405" OD [outside diameter] x 0.269" ID [inside diameter]. Schedule 80, 1/8" is 0.405" OD x 0.215" ID. McMaster 105 lists actual ID/OD for various "nominal" sizes of pipe; current online & print editions do not. So my old Catalog 105 still gets lots of use. A steam buddy who is a plant engineer fished it out of the dumpster at work, used it for a few years, then sent it to me when his wife got after him to clean up the clutter in his shop. Anyway, "nominal size" is kinda like lumber, where, for example a "two by four" plank doesn't actually measure 2 inches by 4 inches, but rather 1.5" x 3.5". This "nominal versus actual/measured size" thing has screwed me up on a few occasions. If somebody says "half inch pipe", ask if that's nominal or measured size, but be warned that they might get surly about it. 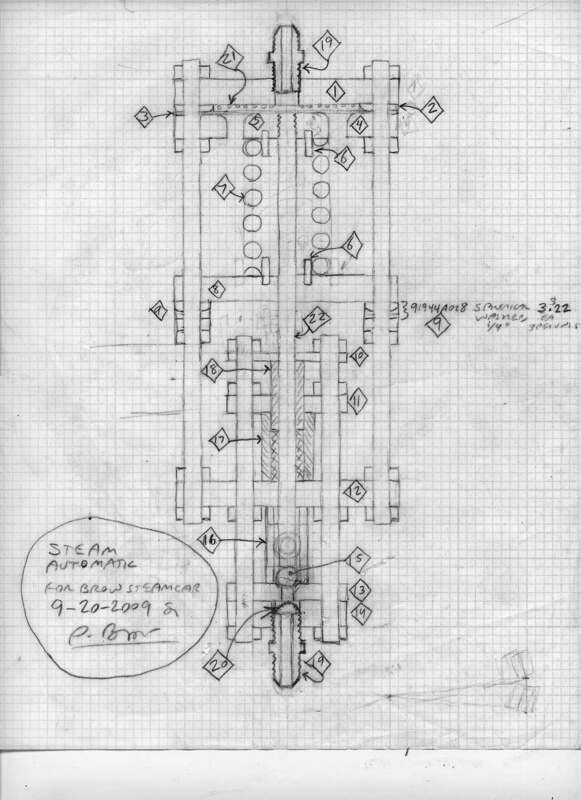 Note that the valve in the Light Steam Power Steam Automatic drawing [above] shows 2 fuel outlets. This was for the earlier Stanley burners, with 2 separate vaporizers, one vaporizer tube per fuel jet/mixing tube. In the gasoline versions, those were straight pipes that ran from one side of the burner across the middle of burner grate to the fuel jets/nozzles. 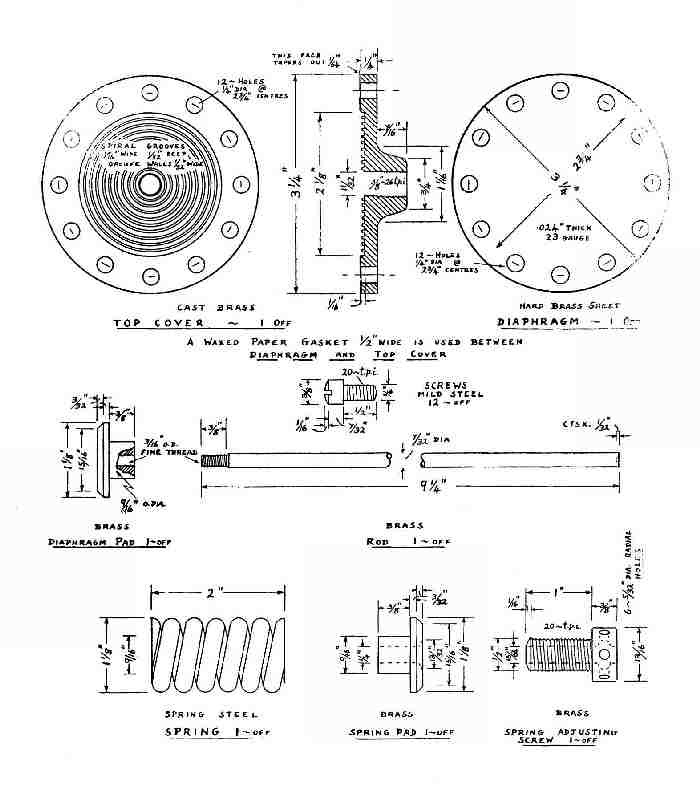 1915 and later, there was one fuel outlet from the Steam Automatic, sending fuel to one coiled vaporizer with a "hot dog" [short, larger OD/thicker-wall section of pipe] over the pilot light, and 2 branch tubes from that sending fuel vapor to jets/mixing tubes at the outlet end. Diaphragms and Bourdon tubes taking water instead of steam: look at the better steam plants, and you will see little loops of tubing right under boiler gauges/pressure sensors, to keep cool water in there instead of hot steam. I have seen them called "siphon loops". Some operators fill those with glycerine or oil to prevent freezing in some applications, like where the gauge is exposed to freezing weather. The above is old news to the regular posters here; just some notes for any steam newbies who might be reading. Steam power has endless fascinating details and an endless learning curve. Always a challenge. One great reference book is "Collecting And Restoring Old Steam Engines", by Richard J. Evans (Blue Ridge Summit, PA: TAB Books, 1980). Well illustrated, and with lots of practical how-to info on boilers, pumps, gauges, valves, etc too; Evans owned and operated at least one steam car and lots of other steam equipment. He gets right down into details like tube loops to handle thermal & pressure expansion and vibration. Used copies are probably available via Amazon or eBay, maybe even a free Google Books electronic edition by now for all I know. OK, I think I'm starting to ramble off topic yet again, so I better sign off. One last bit. Thanks for the compliment on the handcrafted drawings. CAD is great, but I agree that hand drawing is more conducive to creativity, at least in my personal experience so far. When I tried learning that early CAD program, I found that I was more focused on the mechanics of the drawing process than on what I was trying to design/draw. On the other hand, maybe that was because I was learning the [possibly not so user friendly] CAD software from square one, whereas I can do graphpaper/pencil drawings practically in my sleep with both hands tied behind my back. Maybe after a number of years of experience with CAD, using it would become just as instinctive & automatic as paper drawings. 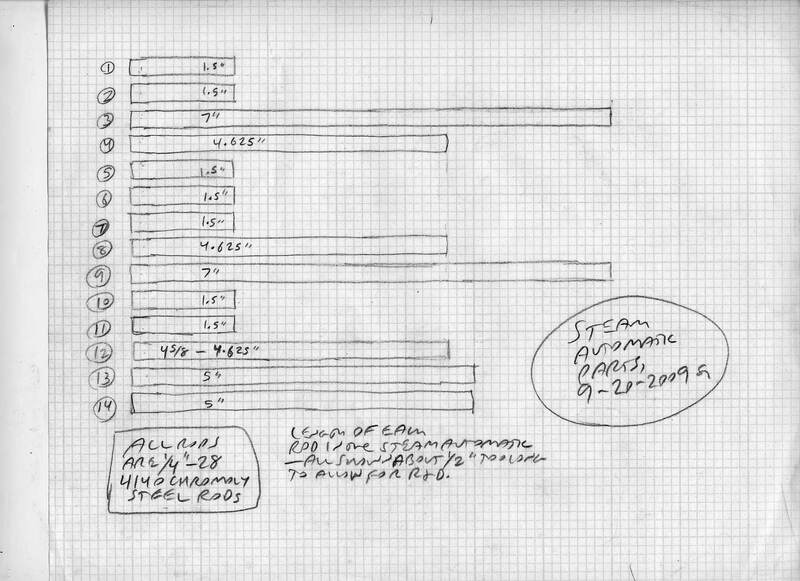 On the third hand, how much steam designing/building would I miss out on, while re-programming my brain for CAD -- and for the constant software changes/upgrades. In the early "oughties" I got to talking at the coffee house with a guy who ran a professional machine shop [he noticed that I was working on complex machine drawings], and he offered to make any parts I had a problem making in my own shop. I showed him some drawings and apologized for how crude and unprofessional they were. His reply was, "no problem, we work from much worse sketches on the back of envelopes and napkins all the time; at least your drawings have all the dimensions and details and everything is to scale." Around the same time I rented a cheap room to a student who was taking a professional CAD/CAM course, and got to talking with him about this. He said that converting customers' rough sketches and even verbal descriptions/ideas into CAD was part of the training course he was taking, and part of the job at custom/small-job CAD/CAM/CNC machine shops. A year later, after he got his certification, he was earning a very good living in an entry-level job at a CNC shop, making custom parts for motorcycles. Quote: "When I tried learning that early CAD program, I found that I was more focused on the mechanics of the drawing process than on what I was trying to design/draw." Yep, that's a problem with a lot of CAD programs, they require a formal education process, instead of jumping straight in to it and trying to decipher it like a puzzle. It's distracting and ruins the whole creative process. I started out with AutoCADR14, what a nightmare that was, I worked with that software for a few months, it took forever to do nothing, too much stuff that isn't needed to do simple engineering drawings. There are much easier programs to use that are adequate for shop use. I've used Turbocad, which is reasonably priced, for at least 20 years - I don't use the 3d function as the basic 2d allows me to do all the drawings I need and is relatively simple to use. I started with Solidworks back in 1999 then upgraded to 2000. I paid $6500 for my seat and $4000 for the windows NT computer. That's how I became a windows NT admin. I recent bought another seat in 2016. and using 2000 is much more easy than 2016. The creative process is not lost with it.